Everyone’s "faith story" is different. In the book, people of Christian and Jewish faiths share their personal stories about this life-changing and powerful event, providing inspiration and encouragement to readers.Chicken Soup for the Soul: Finding My Faith is filled with inspiring stories about the number of ways people discover, or rediscover, their faith -- whether it’s Christian or Jewish. The inspirational and powerful stories will touch the hearts and souls of readers. I absolutely love Chicken Soup for the Soul books. Finding My Faith was no different. There are lots of temptations in this world and reading these short stories in between work, blogging and keeping up with my household reminded me that everyone struggles to find who they are, the purpose of them being here and with finding their faith. There were so many stories in this book that gave me goosebumps and had me in tears. I'd highly recommend this book for every one to read. 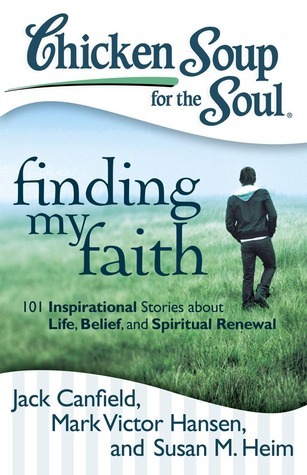 Whether you have faith or not this is a great book with tons of stories about life, belief and Spiritual Renewal. What I love best about the Chicken Soup for the Soul books is that you can read them whenever and wherever. The best part is that each stories aren't that long so even if you are that person that's always on the go and have a few minutes to kill while waiting at the doctor's office or dentist, these books are perfect. You don't have to get invested in a 300 page book, but could read a page or two and finish up a short story that you could relate to or it could help you in some way. Disclosure: All opinions are my own. I received Chicken Soup for the Soul: Finding My Faith at no cost for the purpose of this review. No other compensation was received.